Bansko is a UNESCO world heritage site and Europe's largest ski town. The resort combine the facilities of a modern ski town with the sense of history. In the same day you can ski, golf and enjoy SPA centers. The town of Bansko is located on 925 m. above sea level, and its skiing area is on 2000-2500 m above sea level. Bansko ski resort is situated in South-Western Bulgaria at the foot hills of one of the beautiful Bulgarian mountain Pirin. The Pirin mountain is a natural preserve included in the World Natural Heritage list. The distance between Sofia and Bansko is 170 km. The nearest International Airport is the one in Sofia. Transfer time from Sofia to Bansko is 2,5 hours. The skiing conditions in Bansko are excellent. The Pirin mountain has a predominantly Alpine character with 2 peaks towering above 2900 m. However, the slopes offer runs and tracks for all types of skiers and will suit both beginners and experts. The ski pistes are located in two main ski - centres- CHALIN VALOG (1100-1600 m) and SHILIGARNIKA (1700-2500 m). They are approximately 10 km above the town on the northern slopes of Pirin, which are easily accessed by the newly installed and impressive Gondola lift. 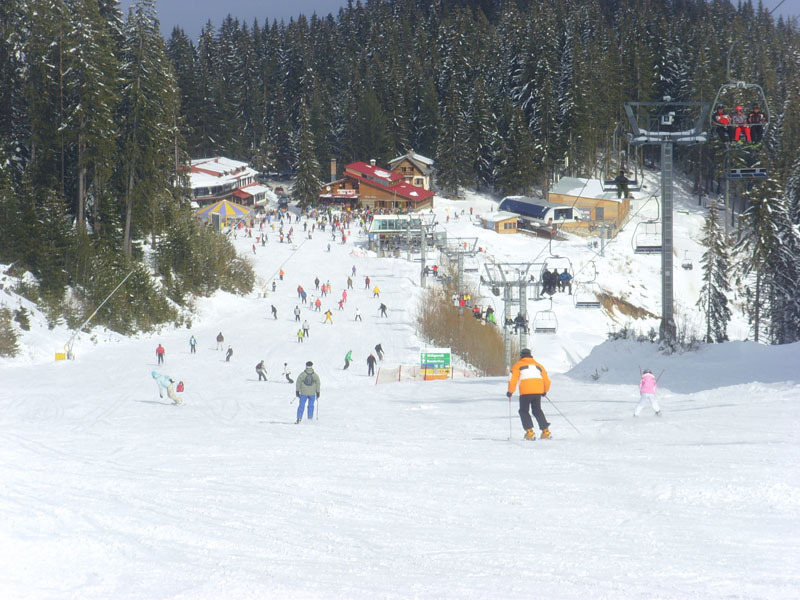 Bansko has 70 km of marked ski runs. The ski zone in Bansko is serviced by 22 km of speedy and 1 gondola lift, 5 four-seat chair lifts, 1 tree-seat chair lift, 3 anchor type tow lifts, 2 single tow lifts, 10 children dragger. Surrounded by The Pirin, The Rila and The Rhodopa mountains Bansko is a nice mountain resort with short summer and long winter. Bansko ski school is a very good one. All school graduates receive skiing certificate. Children above the age of 6 can attend the ski school too. Ski rentals are available. The town itself attracts visitors by its 120 cultural monuments, its museums and the permanent ethnographic exhibitions. A very interesting sight is The Holly Trinity church with its 30 m high bell tower and clock, splendid murals and woodcarvings. Places to go - Of course there's a lot to see in the town of Bansko itself, with around 120 cultural and history monuments will have a lot to explore. Various souvenir shops offer the creations of the local artists and smiths.We also recommend a visit to the famous Rila Monastery and the busy city of Sofia. The Bansko taverns, with unique charm and style offer local cuisine and good selection of Bulgarian wines. Live music is available at some places. "Dedo Pene"is one of the well known places to go. A big number of local cafes are serving any kind of refreshments. Discos and night clubs work without time limit, and usually close early in the morning. Accommodation and catering: As one of the big ski resorts of Bulgaria, practically Bansko offers big opportunities in this respect satisfying visitors of different financial means. There are many luxury hotels. We strongly recommend you arrange your hotel and additional skiing service before you go to Bansko, as the resort is quite busy during the winter.. Bansko offers great skiing, beautiful nature and historical significance.